STRANGE, JAMES CHARLES STUART, fur trader; b. 8 Aug. 1753 in Edinburgh, son of Robert Strange and Isabella Lumisden; m. first Margaret Durham; m. secondly 18 Dec. 1798 Anne Dundas, widow of Henry Drummond; d. 6 Oct. 1840 at Airth Castle, Scotland. James Charles Stuart Strange, one of the earliest of the maritime fur traders on the northwest Pacific coast, was the son of Jacobite parents. His father, an engraver, fought under Prince Charles, the Young Pretender, and James was a godson of James, the Old Pretender. Robert Strange settled in London in 1750. 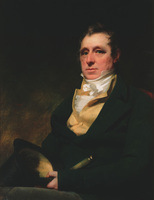 James, along with his brother Thomas Andrew Lumisden, sought a career abroad. Both went to India and were successful in their respective fields: Thomas (who had served briefly as chief justice of Nova Scotia) became chief justice of the supreme court of Madras, and James a merchant in Madras with the East India Company and in private trade. James was on leave in England when the account of Captain James Cook*’s third Pacific voyage was published in 1784 and, like a number of others, including the pioneer trader James Hanna*, he noted with great interest the suggestions made by Captain James King* on how to conduct a fur-trading expedition to the northwest coast. Strange sought the advice of Sir Joseph Banks* and, more important, secured the patronage in India of David Scott, a merchant in the China trade who wanted to loosen the East India Company’s monopoly. Together, Strange and Scott planned an expedition. They privately purchased two ships and named them Captain Cook and Experiment. Both were well fitted out and the venture received some support from the East India Company in the form of a few troops commanded by Alexander Walker*. Strange was to go with the vessels as supercargo and would have overall direction of the enterprise. The expedition, which left India in late 1785, was supposed to serve the two British interests of commerce and exploration, but in the event it made little contribution to either. Strange was too cautious and conservative to be successful as an explorer or a trader. The expense of fitting out the expedition had escalated to the point where only a major trading success could repay the investment. But the voyage was beset by misfortune from the beginning. Strange was unable to purchase goods along the Malabar coast for sale in China as he had planned, and not far out of Indian waters the Experiment was holed, necessitating a call at Batavia (Djakarta, Indonesia) for repairs. Many of the crew had already gone down with scurvy and Strange was ill prepared to deal with the scourge. The China leg of the outward journey was thus abandoned, but even so the expedition did not arrive on the northwest coast until 25 June 1786. It was already late in the season, but Strange anchored at Nootka Sound (B.C.) for a month to gather what sea-otter pelts he could. He conducted the trading negotiations himself and, like other traders, found that the Nootka Indians were shrewd bargainers. More interested in safety than profit, he kept the two vessels together rather than send them out separately to cover more ground. Leaving John Mackay* to establish a permanent shore-base, Strange departed from Nootka Sound in late July and headed north. He did not see anything of the mainland between the northern tip of Vancouver Island and Alaskan waters, and at Prince William Sound he was, once again, too late in the season to acquire many furs. So he set sail for China in mid September to sell what he had. The expedition was a financial disaster. Strange sold his furs for about £5,600, which was not enough to cover the outlay. Nor had he contributed much to exploration and science. Apart from making some discoveries in the Queen Charlotte Strait area, he had added little to geographic knowledge of the northwest coast, and he was not particularly interested in the Indians, except as potential customers, so the account of the voyage by Walker contains much more ethnographic information than Strange provides in his journal. Back in India Strange re-entered the Madras service, but left the East India Company in 1795. He returned to England where in May 1796 he became a member of parliament for the East Grinstead borough of Sussex. Two years later he married a daughter of Henry Dundas, secretary of state for war and the colonies and a former commissioner of the Board of Control for Indian affairs. Ruined by a bank failure in 1804, Strange returned to India to make another fortune before retiring in 1815 to Scotland, where he died in 1840. Strange’s account of his Pacific expedition was published as James Strange’s journal and narrative of the commercial expedition from Bombay to the north-west coast of America, together with a chart showing the tract of the expedition, intro. A. V. Venkatarama Ayyar (Madras, India, 1928; repr. 1929). The PABC holds two transcripts based on different manuscript copies of Strange’s “Narrative of a voyage to the North West Coast of America”: one is a typescript, from a copy belonging to Strange’s descendants (A/A/20/St8A), and the other a handwritten transcript of BL, India Office Library and Records [East India House Arch. ], IOR, H/800: 1–145 (A/A/20/St8A2). Also at the PABC is an original manuscript by Strange of additions to Captain Cook’s vocabulary of the Nootka Sound language, 1785–86 (F/8/St8). BL, India Office Library and Records, IOR, E/4/316–17, 24; E/4/873: 1239; E/4/875: 333; H/494: 419–27; O/6/3: 577; P/240/62: 137; P/241/4: 124; P/241/5: 603; P/241/55: 1790 (copies at PABC). PABC, E/E/St8, extracts relating to Strange; M/St8. James Cook and James King, A voyage to the Pacific Ocean . . . (3v. and atlas, London, 1784), 3: 438–40. Alexander Walker, An account of a voyage to the north west coast of America in 1785 & 1786, ed. R. [A.] Fisher and J. M. Bumsted (Vancouver, 1982). R. [A.] Fisher, Contact and conflict: Indian-European relations in British Columbia, 1774–1890 (Vancouver, 1977). B. M. Gough, Distant dominion: Britain and the northwest coast of North America, 1579–1809 (Vancouver, 1980). David MacKay, In the wake of Cook: exploration, science & empire, 1780–1801 (London, 1985). Robin A. Fisher, “STRANGE, JAMES CHARLES STUART,” in Dictionary of Canadian Biography, vol. 7, University of Toronto/Université Laval, 2003–, accessed April 24, 2019, http://www.biographi.ca/en/bio/strange_james_charles_stuart_7E.html.